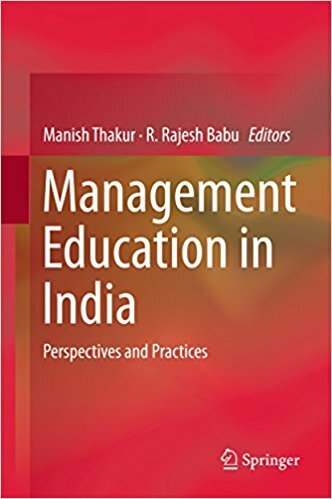 In Management Education in India: Perspectives and Practices, editors Manish Thakur and Rajesh R. Babu bring together contributors to analyse the development of business and management education in India in the context of the nations’s recent social, political and economic transformations. The volume offers a good overview of the role played by Indian business and management schools, finds Maziar Jafary, and also reveals how dominant discourses continue to shape institutions of higher learning across the country. Management Education in India: Perspectives and Practices. Manish Thakur and Rajesh R. Babu (eds). Springer. 2017. Management Education in India: Perspectives and Practices analyses Indian business and management schools in the context of the contemporary social, political and economic transformations of India. In the collection, the contributors try to hold accountable multiple stakeholders in the development of business/management education in Indian business schools, especially in IIMs (Indian Institutes of Management). As such, they study the role of the state, civil society, business corporations, business leaders, academic guilds and students in the development of business/management education across the country. The book consists of an introduction written by the editors, Manish Thakur and Rajesh R. Babu, followed by two sections. The first deals with the very idea of business/management education in India, especially in the neoliberal era that began in 1991. The second part contains eight chapters discussing the study and role of several academic disciplines in contemporary India. In their introduction, by analysing the state-based economic modernisation of India during the Nehruvian era (1948-1991), Thakur and Babu posit that the foundation of IIMs in different Indian cities during the 1950s and 1960s was based on the creation of a new class of state elites who were in charge of the industrialisation of the country in the public sector. However, as the authors state, during the increasingly neoliberal era from the 1990s, interest in Indian business/management studies was drowned out by newly introduced curricula designed to adapt the latter to the liberal growth of the Indian economy. There has been a transition from the ‘management’ vision based on social imagination to a ‘business’ view of modern India during this time. It was driven by both a failure to create a shared vision of society and the global collapse of socialism (49). As such, business/management studies in India were transformed from ‘scientific fordist managerialism’ in the 1950s and 1960s into ‘market managerialism’, which insists that ‘only markets run by professional managers can efficiently organize human interaction’ (28). Subsequently, the first part of the book concentrates on the divisions between the curricula taught and practised in business schools and the realities of Indian economic and social mutations. Nimruji Jammulamadaka, Sinha and Abhoy K. Ojha criticise business/management education in India because of a failure to adapt to Indian economic realities and social transformations, particularly in three aspects of learning: literature, tools and academic techniques. These authors argue that Indian management studies should be ‘decolonized’ (23-42) in order to avoid the ‘simulacra effect’ (55-79), which leaves Indian business/management students alienated from their studies. In other words, they propose that Indian business/management intellectuals more actively participate in the process of knowledge production based on Indian social relations and its historical cultures. The second section of Management Education in India explores the role of various disciplines in business/management studies in India. As in the first part, the authors explicate the lack of consistency between the curricula of such schools and Indian social/economic needs. As Babu reminds us: ‘In India, the business schools are traditionally modelled according to the American counterparts, and the approach towards the design of the business curricula is no different’ (165). Across eight chapters, contributors elaborate how the teaching of various educational disciplines is divorced from the realities of Indian society. Jacob Vakkayil, Megha Sharma et al, Basu and Partha Ray address the introduction of organisational behaviour, mathematics and economics in Indian business schools. As they discuss, the teaching of these should be applicable to the realities and needs of Indian society and not a simple reproduction of western theories. Vakkayil writes: ‘Here, rather than imitating Western approaches that privilege paper productivity, we need to develop our own models for what constitutes good research’ (89). Similarly, Ray proposes the use of inductive methods rather than deductive ones in order to further benefit from case studies in Indian business education. In the fourth and sixth chapters, Neog and Babu remark on how business ethics and business law are neglected in Indian business schools. For Indian business education, morality equals charity and spirituality. As such, the authors argue that business ethics are assumed to be a part of Indian culture; consequently, business/management schools feel no need for its introduction in their curricula. Although Neog believes that business ethics should be consistent with Indian local cultures, he states that Indian business people sometimes find themselves in certain professional situations where they do not know how to conduct their actions or how to react to newer problems in the business/management world. While management studies focus on leadership-based approaches, Indian intellectuals tend more to employ Indian mythology and spirituality in order to promote inspiration-based leadership and project management. Decolonization of knowledge can be accomplished only with a respectful acknowledgement of different societies. It begins by delinking from Western epistemic categories and examining phenomena from other sets of categories including those of the once colonized (40). For example, one of the means by which Indian business people try to act morally in the Indian business world is to introduce personal/familial relations and logics into professional work (40-41). As shown in Indian cinema and literature, such attempts are based on the reconciliation of Indian ethics and professional business. However, these efforts reproduce the same business/management discourses using Indian cultural language, i.e. the ethics of charity. In this respect, I believe that Management Education in India is a good introduction to business/management studies in India, despite the lack of clarity on how the authors look into the localisation of this phenomenon across the country. As a result, this book is important for further studies, not only to analyse the influences of localisation, but also to research the ways dominant discourses remain reproduced in institutions of higher learning in India. As a PhD student in sociology at the University of Ottawa, Maziar Jafary studies how Indian business/management schools’ students deal with the neo-managerial discourses offered in these institutions. In his studies, he applies ‘French pragmatism’ as a theoretical framework in order to better understand the way Indian students adapt their socio-cultural background with newly introduced curricula in the aforementioned schools.